Real Estate Staging We deliver curb appeal! We can install an attractive landscape – or add to the existing garden – so potential buyers can see the beauty of your property. Specializing in drought tolerant gardens and full or partial lawn replacements, we will collaborate in creating a garden design that best fits your property and your budget. We want to ensure that your garden is installed with the highest quality of plants, materials, and expertise. That’s why we prefer to personally plant our own designs. What good is a beautiful garden if you can’t sit outside and enjoy it? With your input we can create an outdoor living space that will be comfortable and inviting all year-round. We’re also happy to help out the do-it-yourself home gardener. Pick our brains on how to improve your garden or any other horticultural questions you may have. We can visit your garden weekly, monthly or seasonally, depending on your garden’s needs. 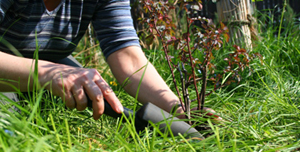 We will prune, weed, and otherwise clean your garden, while periodically fertilizing and mulching. Let us the do periodic dead-heading, fertilizing, and mulching that your rose garden needs in order for it to bloom vigorously during the growing months. We will also prune and spray your roses in January so they get a healthy start on the year. Nothing says spring like snapdragons and pansies. We can visit your garden seasonally to change out your annual flowers or vegetable garden. So you have a potted garden but don’t know how to take care of it? We can provide all the care your pots need to grow and bloom. 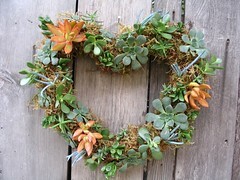 Our handmade succulent wreaths and baskets are attractive and unique decorative accents to your entryway or patio area. They also make great gifts! Don’t have space for a garden? A potted garden is a beautiful and practical alternative for those with small courtyards or balconies. We’ll select the pottery and plants, and leave you with spectacular arrangements that you will enjoy throughout the seasons. Potted succulent arrangements are easy to care for and are very rewarding. We customize each arrangement to our client’s preference and style, and are happy to prepare them as living gifts. View examples of our specialty items in our portfolio.